Punctual, friendly and helpful! Presented with a variety of options going forward and out in less than 1 hour. Excellent! Best experience I've ever had at a doctors appt.. Was seen quick. The doctor listened to my concerns and ordered appropriatetests and had a great bedside manner. Highly recommend! Best experience I've ever had at a doctors appt.. Was seen quick. The doctor listened to my concerns and ordered appropriate tests and had a great bedside manner. Highly recommend! Henry Cheng is a caring and competent family physician caring for the Anaheim Hills, CA community. 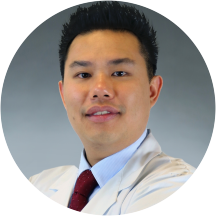 Dr. Cheng earned his medical degree from the American University of the Caribbean School of Medicine. He also completed his residency in family medicine at Mercy Medical Center Redding. He obtained his bachelor’s from the University of California, Los Angeles. Dr. Cheng is board certified by the American Board of Family Medicine and is affiliated with Fountain Valley Regional Hospital and Medical Center in Fountain Valley, CA. Dr. Cheng sees patients for illness, as well as other common and specialized reasons. Outside of his practice, Dr. Cheng enjoys mountain biking, hiking, racquetball, and violin. Dr. Cheng is deeply committed to the well-being of his patients. He takes a thorough and precise approach to his consultations to ensure that he is consistently giving accurate diagnoses. *New Patients please arrive 15 minutes early to your appointment to complete new patient information and insurance verification. I like the doctor, He is professional, and most important thing is he can speak some Chinese, that helps a lot for the communication. professional and takes time to discuss my health. Dr. Cheng is intelligent, knowledgeable, personable and professional. Hes attentive and genuine. My family and extended family chose him as their primary physician and are very pleased. Once again, Dr. Cheng was great. He took the time to address all of my questions and brought welcome humor to an anxious patient. Thank you Dr. Cheng. Dr, Cheng is a keeper. He listened to what I had to say, gave great feed back and recommendations, and did not make me feel rushed. Dr. Cheng has a wonderful staff. Every is really great. They actually call you back when they say they will. They are funny and personable which makes going to the doctors a positive experience. Dr. Cheng also has a good bedsidemanner. He stops to listen to his patient and considers your concerns. As a parent, it's good to have a doctor who listens to you intuitions while providing you with medical advice. We just moved to the area and have been searching for a new family doctor. With 4 kids and a husband, 3 doctors later, we are definitely staying with Dr. Cheng. Clean office. Helpful staff. Kind doctor with patience! Takes his time to answer all your questions. My husband refuses to see a Dr but after first visit with Dr. Cheng he felt very comfortable and feels that he's health is in good hands now. Overall it was a good first time meeting with Dr. Cheng. He gave me options as far as treatment so that alone tells me he's open to different ideas. Very friendly and helpful staff. Dr. Cheng was great and did not rush. I am glad I found such a great doctors office. Dr. Cheng was very punctual and very friendly and was very knowledgable about made me fee very comfortable and did not rush me whatsoever until I understood all of his information. Highly recommended!